Led Ashtanga yoga class is a dynamic method of choreographed sequences of postures linked with breath and concentration techniques designed to stretch, strengthen, and detoxify your body. This traditional led Ashtanga Yoga class is tailored to the varying levels of the students present. Expect to sweat and be challenged! Class will follow half of the Primary Series (up to Navasana, depending on the level of the group). Some simple hands on adjustments will be offered, and modifications will be shown. Ashtanga yoga is great for building core strength and toning the body. This class is good for different levels of students but not recommended to complete beginners in yoga. Don't worry though: you will be guided through each pose with instructions that will include modifications to allow you to safely practice. Core & Restore flow will alternate stretching & restorative poses with powerful flow that focuses on core strength and stamina. The class will allow you to build strength and flexibility while pacing each movement with the breathing. The class closes up with a restorative pose to allow deep relaxation of the muscles. Adjusted to the students attending the class this flow can be a strong core flow that focuses on core strength, deep hip openers and inversions as well as a gentle flow with easy stretch and balance asanas. This class is good for different levels of students: you will be guided through each pose with instructions that will include modifications to allow you to practice safely. Restorative yoga class is designed to relax the nervous system and mind. There are a lot of props involved: they will allow you to sink deeply an deliciously into yourself. It is a very slow and relaxing flow: we will spend 5-10 minutes in each pose. These poses are going to allow muscle release, increase relaxation inducing centre in the brain, deep relaxation which triggers chemical reactions to break down stress hormones. Private yoga lessons customized to meet your needs to deepen personal practice, gain confidence, be mindful about your physical condition, and receive guidance according to your present goals. Our Intro level classes are perfect for adults without previous experience. No need to be a high profile athlete to try aerials. Come as you are and we’ll build your skills in a welcoming and supportive environment. Are you ready to fly? The aerial fitness class is going to help you get into the best shape of your life. 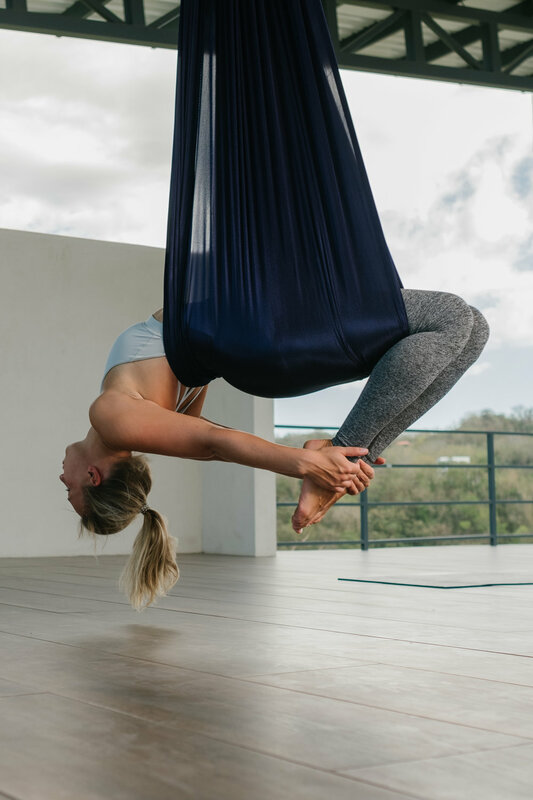 Aerial yoga delivers myriad health benefits including elevated mood and improved digestion, lymphatic drainage, brain function and back health. The aerial fitness class incorporates elements of conditioning for upper body in and outside the silks. The silk wraps around your body and supports you in certain difficult poses like inversions, giving you the experience of how a pose should feel. In other words, taking a few aerial classes might raise your game in your regular yoga classes as well. De-stress in the hammock where you get ready to experience a gentle, calming, therapeutic decompression of spine, softening of muscles and a surrender of mind. Using the support of the fabrics, it becomes a brush stroke flow of movements that release, restore, and stretch the body to a new construction. As the body becomes present and still, you will find yourself generating an evolved relaxed thinking, an ease of softness, and a recharged state of mind.